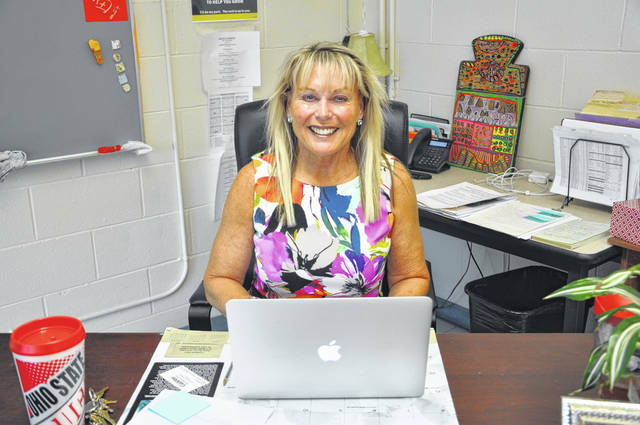 Vicki Koogler sits behind her desk at Hayes High School Wednesday. For the last 38 years, Vicki Koogler has taught family and consumer science at Hayes High School, but at the end of May, she will be retiring to spend more time with her family. Koogler said she studied family and consumer science and had substitute taught and worked as a full-time teacher for about 3-and-a-half years before she interviewed for a job at Hayes to teach family and consumer science, formerly called home economics. She was hired in 1980. Koogler said family and consumer science has changed a great deal since 1980. Koogler said she is a co-dean of House Sugar Grove, one of Hayes’ eight houses that were implemented in 2015 to give students a great sense of community, and she thinks the program has had a positive effect on Hayes. Koogler said as co-dean, she has brought in speakers and presentations for her house to educate them and prepare them for adulthood. Koogler added she and her husband live in Dublin, and she’s received numerous job offers elsewhere, but has turned them all down because she wanted to stay at Hayes. Koogler said she is retiring because one of her sons, who lives in Seattle, Washington, had a baby and she wants to be able to take the time to visit her grandson. Koogler added she is also looking forward to visiting her other son who will be starting a fellowship in New York. She added that she feels like the Delaware community has become part of her family. Koogler said she also plans to travel more often with her husband after she retires May 30.
https://www.delgazette.com/wp-content/uploads/sites/40/2018/05/web1_DSC_0321.jpgVicki Koogler sits behind her desk at Hayes High School Wednesday.